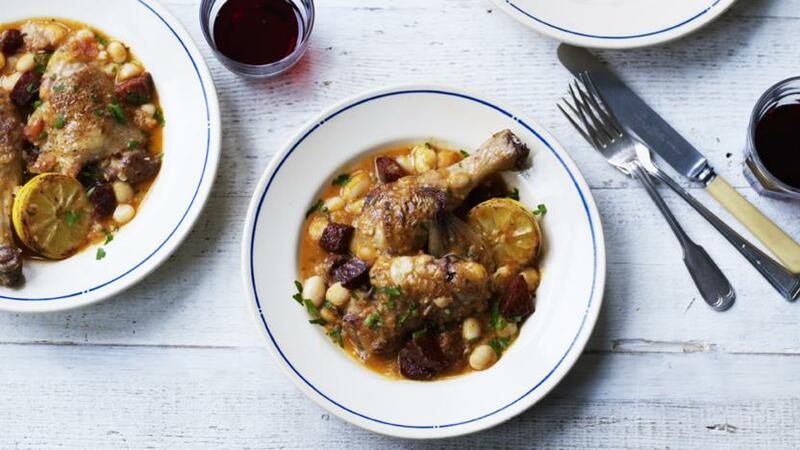 This lush chorizo and chicken stew recipe is inexpensive but delicious. Try serving it with crusty bread. Heat an ovenproof frying pan until hot, add half of the olive oil and half of the butter. When the butter is foaming, add the chicken and fry until just golden-brown. Cut one shallot in half lengthways and add to the pan along with the lemon and half the rosemary and thyme. Add the garlic, reserving two garlic cloves. Roast in the oven for 15 minutes, or until golden-brown and the chicken is cooked through. Meanwhile, finely chop the remaining shallot and reserved garlic cloves. Heat a large frying pan or sauté pan until medium-hot. Add the remainder of the olive oil and the chorizo and cook for five minutes, or until the oil has changed colour and the chorizo is crisp around the edges. Add the tomatoes and the chopped garlic and shallot. Gently fry for a minute, then add the beans and the rest of the rosemary and thyme and cook for a further two minutes. Add the stock and bring to a simmer. Cook for 4-5 minutes, or until the shallot has softened and the volume of liquid has slightly reduced. Stir in the last of the butter and the parsley. Season to taste with plenty of black pepper. Ladle the beans into the middle of two soup plates, top with some chicken, then place a piece of lemon, shallot and garlic alongside.